The ruling New Patriotic Party (NPP) has inaugurated a 50 member communication team at Dome-Kwabenya Constituency. The move forms part of efforts to beef up the party’s communication activities in the constituency ahead of the 2020 general elections. The 50 member team is made up of 36 zonal communication chairpersons and 24 free agents communicators. Members from all the 18 zones of Dome-kwabenya constituency which includes: Taifa north (A&B), Taifa south (A&B), Dome East (A&B), Dome West (A&B), Kwabenya zone (A&B), Agbogba, Ashongman/Ablade, Oko/Pillar two zone, Haatso (A&B), Atomic Zone, Abokobi zone and Ashongman estates, are represented on the team. The communication team was set up to inform and educate the people in the constituency about the NPP government’s ongoing projects, earmarked projects, and achievements. This is the first NPP’s communication directorate to be set up and inaugurated at the constituency level, DGN Online gathered. The members undertake house to house visits, radio and TV discussions, zonal tour and public awareness on government achievements, and organize seminars and presentation. The communication team has a year long program for the constituency which include: general clean up exercise, constituency tree planting exercise, town hall meetings, press conferences, party achievements and awareness float. In his speech, Ato Welbeck, the communication officer for the directorate charged the team to offer their all to realise the aim of the communication directorate. He also acknowledged the speaker of parliament Mike Oquaye, Lawyer Adwoa Safo, Chairman Solomon Asante and the constituency executives Committee which is chaired by Robert Osei Bonsu for their immense support. 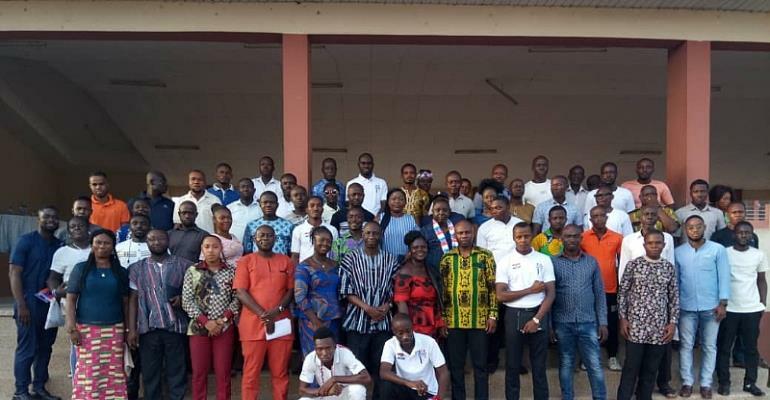 The deputy Greater Accra Communications Director, William Frimpong-Bonsu who supervised the inauguration of the communication team pledged his support, on behalf of the Regional Directorate, led by Nana Francis Ebo Mensah, for the group. He praised the Dome Kwabenya NPP communication directorate for being the first to be set up and inaugurated in the party at the constituency level. He promised to replicate it at all the constituencies across the country. The program was graced by national, regional, constituency representatives and party members.